WHEN YOU MEET SOMEONE FROM YOUR SOUL GROUP, IT STIRS FEELINGS WITHIN YOU UNLIKE ANYTHING YOU’VE EVER EXPERIENCED BEFORE. Consider them to be your “soul family.” They are people who are cut from the same energetic cloth, so to speak. See, we all function on a certain frequency, or vibration, and our soul group belongs to the same frequency as us. When we find a member of our soul group, which is a rare thing to have happen, we feel a connection so special that we want to hang on to them forever. THESE PEOPLE FEEL COMFORTABLE AND FAMILIAR TO US. AFTER ALL, BEFORE WE WERE FRIENDS, WE WERE FAMILY. When we are drawn to another person, for seemingly no reason at all, it is usually a sign that individual is a member of our soul group. Sometimes you feel yourself being pulled towards their positive energy, and you just can’t explain why. 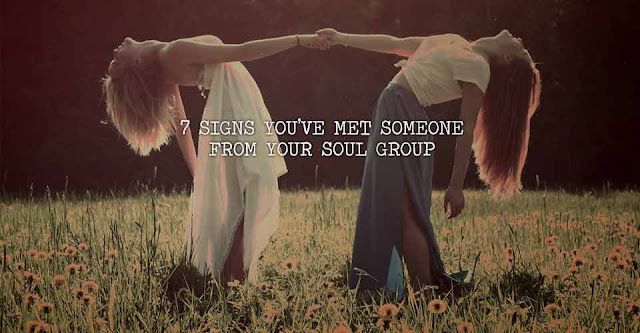 WHAT OTHER SIGNS ARE THERE THAT YOU’VE MET SOMEONE FROM YOUR SOUL GROUP? 1. You feel as if you’ve known them your whole life. It’s a level of comfort you never expected to have with someone so soon. 2. They have had similar life experiences as you, and they help to show you new ways of handling old problems. 3. You lose track of time around them. In fact, time seems to stand still when you are together. It’s as if the whole world only consists of you two. 4. They have surprising wisdom and insight. You find yourself constantly surprised by the profound words that come out of their mouth, and how everything perfectly applies to your life. 5. They show you the best in you, and reveal the beauty in yourself that you never realized was there. They teach you how to turn your weaknesses into your greatest strengths. 6. When they come into your life, it is right when you need it the most. Chances are, you won’t truly understand this until you both go through the experience you were meant to, together. 7. They help you to learn lessons you thought you had already conquered, and show you the hidden meaning within. Some lessons are painful, but your soul group helps you every step of the way.